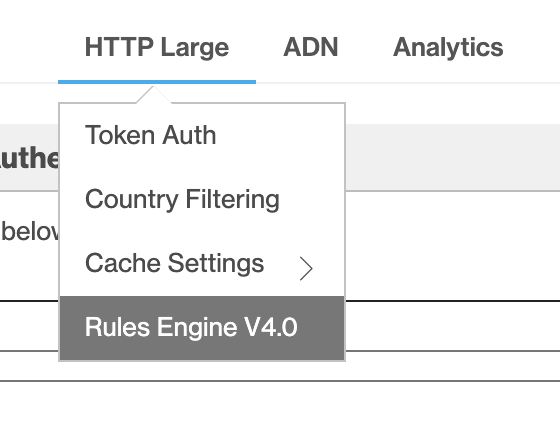 The Azure CDN rules engine allows you to customize how HTTP requests are handled. For example, blocking the delivery of certain content types, defining a caching policy, or modifying an HTTP header. This tutorial demonstrates how to create a rule that changes the caching behavior of CDN assets. For more information about the rules engine syntax, see Azure CDN rules engine reference. Select the HTTP Large tab, then select Rules Engine. 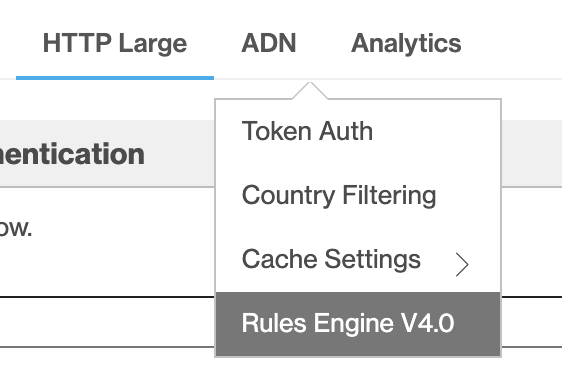 Select the ADN tab, then select Rules Engine. ADN is a term used by Verizon to specify DSA content. Any rules you create here are ignored by any endpoints in your profile that are not optimized for DSA. The options for a new rule are displayed. The order in which multiple rules are listed affects how they are handled. A subsequent rule may override the actions specified by a previous rule. Enter a name in the Name / Description textbox. Identify the type of requests the rule applies to. Use the default match condition, Always. Multiple match conditions are available in the dropdown list. For information about the currently selected match condition, select the blue informational icon to its left. For a detailed list of conditional expressions, see Rules engine conditional expressions. For a detailed list of match conditions, see Rules engine match conditions. To add a new feature, select the + button next to Features. In the dropdown on the left, select Force Internal Max-Age. In the textbox that appears, enter 300. Do not change the remaining default values. Multiple features are available in the dropdown list. For information about the currently selected feature, select the blue informational icon to its left. For Force Internal Max-Age, the asset's Cache-Control and Expires headers are overridden to control when the CDN edge node refreshes the asset from the origin. In this example, the CDN edge node caches the asset for 300 seconds, or 5 minutes, before it refreshes the asset from its origin. For a detailed list of features, see Rules engine features. Select Add to save the new rule. The new rule is now awaiting approval. After it has been approved, the status changes from Pending XML to Active XML. Rules changes can take up to 10 minutes to propagate through Azure CDN.